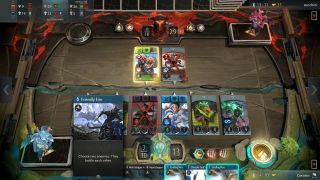 Artifact’s first update is live now. 1.1 is mainly concerned with social features—you can chat now, sort of—but there are also new tournaments, colourblind support and two new decks have been added to The Call to Arms event. You can possess your cards—that’s how you chat. Every hero and creep has fully voiced dialogue that you can control by selecting lines from a dialogue wheel. You can also send custom messages using the cards or invite people to chat on Steam. Messages from non-friends can be blocked during a match if your opponent starts spouting toxic nonsense, however. If you want the challenge of a tournament but your busy life leaves you no time for faffing around and setting one up, there are open tournaments. They’re automated, short tournaments that Valve says are “nearly effortless” to join. It just takes one click and you’ll be placed in one. The first open tournament is Pauper. You can only use common cards, though you’re able to switch your deck after every match. There’s a new free-for-all tournament mode, too, giving players three hours to fight and win as many times as possible. At the end of the three hours, the player with the most victories will be declared the winner. The Call to Arms event pits players against each other using premade decks, and 1.1 has added some new ones. The Dark Aggro deck is all about disrupting your opponent’s mana with the signature card, while trebuchets and catapults will help you take out enemy towers. Death from Above, meanwhile, uses Frostbite as its signature card and lets you batter your enemies with magic, disintegrating them or even making them fight each other. Win these battles and you’ll climb the new leaderboard, which resets every two weeks. Check out the full patch notes here. Another update is also in the works. It’s due out next week and will introduce a new progression system.